What happens if you bravely try to trim your cat’s claws and (oh no!) the claw starts to bleed? You’ve cut a little too deeply into the claw. Instead of trimming the clear, bloodless tip, you’ve cut into the part of the claw that has a blood supply. My guess is that if something can bleed, it can hurt. What with cats being so stoic about pain — and so dramatic about everything else! — I don’t know for sure if and how much that bleeding claw hurts. ** My opinion (me, Linda, not Dr. Plotnick) is that it’s easier and just as compassionate to simply wait for the blood to clot. It will clot in a few seconds. I dab it with a tiny piece of paper towel. I don’t use styptic powder because I heard that it can sting a bit, and anyway, I haven’t found it to be necessary, so why do extra things to a cat? Also, I’ve found from experience that many cats will not hiss or have any reaction at all if you nick them. Not that I nick cats every day, but the few times I have, I’ve only realized what I’ve done when I check the claws after finishing. There will be a little drop of blood, sometimes not even a drop, just a hint of redness at the tip of the claw. Even if it’s just a tiny bit, I still wait for it to clot. I do know that when I’ve cut too deeply on my own nails, it hurts like a house on fire. In fact, one of the ways evil people torture other people is by sticking pins in the pink part of the nail. What if you do make a mistake? I’ve done it. Even with the best of intentions, if the lighting isn’t great, the cat jerks their paw, or it’s just an “off” day, mistakes can happen. Anyone who says they never make mistakes might be in early-stage Alzheimers. Either that or they’re lying. The good news is that claw blood clots up fast. If you want, and if you can manage it, you can put a little bit of tissue paper against the bleeding claw until it clots. It’s not a big deal, apart from the sadness we all feel when we do something that might hurt our beloved cats. Cats seem to get over it quickly. Don’t let fear of nicking the claw stop you from trimming the claw. Over time, you’ll get better. If you really can’t do it, or don’t want to do it, call me. I’ll be happy to visit. I’m not a fanatic about frequent claw trims. As long as your cat’s claw isn’t getting snagged on you or on furniture, you’re probably fine. If you’ve got an old, fat or sick cat, you might need more frequent claw trims because the claw could grow into the pad. If that happens, there’s now a hole in the paw pad because the claw is poking into it. Paw pads do have nerves, so my guess is that hurts at least a little. Paw pads don’t need ventilation! What is the best use of time? Claw trims & time. 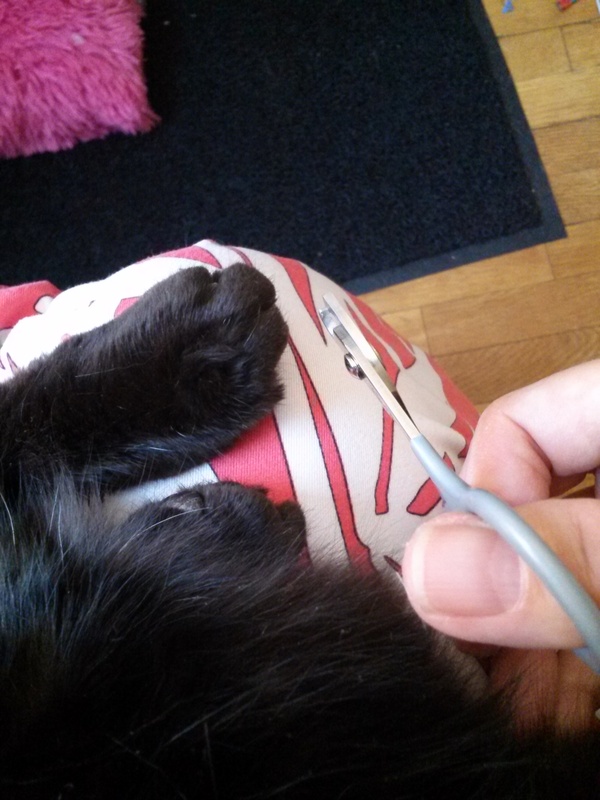 Let me help you decide whether or not to hire a house call cat groomer for claw trims. When people choose to buy prepared pre-packaged meals instead of shopping, cooking and cleaning up, they are making an instinctual decision about the best use of their time. Ah, but it’s not that easy. What is the value of your time AWAY from work? What is the best use of those precious hours when you are not in an office or tied to your laptop answering emails from the Boss? I’d guess the value of non-work hours is double the value of work hours because of scarcity. When a desired item — such as time to relax — is scarce, the value of that item rises. That means one hour of relaxation time is worth almost $60.00, for those earning $60,000 a year. You are “spending” $60 when you use one hour for a non-relaxing activity during your limited relaxation hours. What do you want to do with that hour of relaxation time? Do you want to put your cat in a carrier and walk to the salon or clinic for a claw trim, or do you want to hire a cat groomer to trim the claws? My claw trim visits generally take 15 minutes. Should you have a groomer trim your cat’s claws ? This is the claw trimmer I use. The cat in this photo is on my lap. She is a relaxed cat. Are you a calm, patient person? Does your body tense up when you hold your cat? Are you a quiet person, or do you use a loud voice at home? Are you willing to try different ways of holding your cat? Are you willing to trim the claws in a piecemeal fashion, a few claws every now and then? Does your cat lay still for claw trims? Does your cat wiggle just a bit or is your cat a major wiggler? Does your cat hiss, scratch and even bite during claw trim attempts? Do you have a condition that makes being scratched more of a concern, such as a blood condition or susceptibility to infection?